Compact and durable steel enclosure houses state-of-the-art universal 16-port and 8-port USB boards (CE, ETL listed). 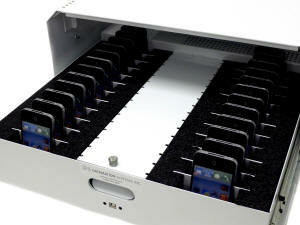 Ideal Sync and Charge Station for multiple iPhones and iPods use in health and hospitality organizations. Can be used to charge and sync any iPod™, iPod Touch and iPhone™, as well as virtually any smartphone that charges with USB. Features unique future-proof updatable firmware. Power supply: 275W, 5V, 88~264VAC, constant current limiting circuit, overload/over voltage/short circuit protection, all applicable safety approvals. The power supply is dual voltage 115/230 VAC. Power supply plugs into a wall outlet with cord (provided). 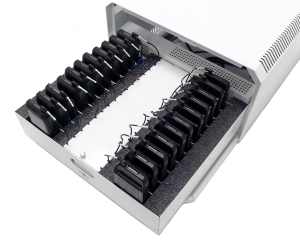 If you are deploying or managing multiples of a smaller mobile device – such as iPhones™, iPods™, iPod Touch™ or smart phones – Datamation Systems has created storage strategies that incorporate state-of-the-art charging and syncing hubs. 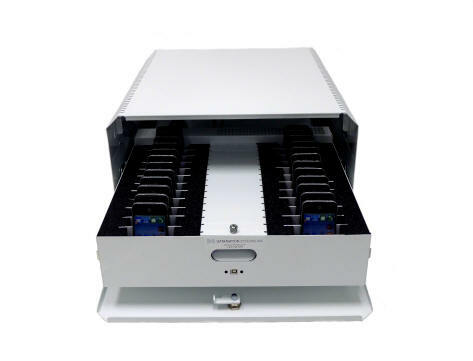 These trays and drawers equipped with foam interiors (some with adjustable dividers) that store and secure just about any type of mobile device, even cases or equipped with scanners, card readers or extended batteries. They provide easy access to built-in professional charging or sync-charge hubs and their power supplies. 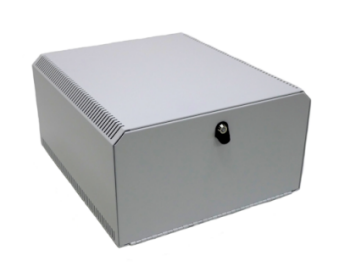 Some versions even provide security, locking th contents in a table-mounted enclosure. Like our other charge and sync options, these provide up to 2.1A per port (500mA in 32-port configurations), and are powered by the best-in-class USB technology of Cambrionix. They have been designed for professional use and the highest performance standards.